The statement, issued to AppleInsider and other media venues on Wednesday morning takes Bloomberg to task for reporting suggesting that Face ID sensor sourcing has resulted in a less accurate product. Customer excitement for iPhone X and Face ID has been incredible, and we can't wait for customers to get their hands on it starting Friday, November 3. Face ID is a powerful and secure authentication system that's incredibly easy and intuitive to use. The quality and accuracy of Face ID haven't changed. It continues to be 1 in a million probability of a random person unlocking your iPhone with Face ID. Bloomberg's claim that Apple has reduced the accuracy spec for Face ID is completely false and we expect Face ID to be the new gold standard for facial authentication. The statement does not refute that testing changes have been made —only that any changes possibly made do not impact the accuracy of the system —already significantly less prone to erroneous identification than Touch ID. A report on Wednesday morning made the claim that Apple had lowered testing standards for the Face ID sensor system to improve yields. AppleInsider noted the report, and also made the observation that Face ID was likely not reduced in accuracy because of any rumored shift. The iPhone X is "an aggressive design," according to sources familiar with the matter cited in Bloomberg's earlier report, with a "very aggressive schedule." As part of the component supply problems, according to more unnamed sources, Foxconn reportedly pulled as many as 200 workers off an iPhone X production line. Apple's iPhone X features a 5.8-inch Super Retina OLED display, the A11 Bionic processor, and the apparently hard-to-produce 3D-sensing TrueDepth camera at the core of the Face ID technology. The device ships Nov. 3, and starts at $999 without any promotions. The TrueDepth camera system maps the geometry of the user's face using "advanced technologies," which consists of an infrared camera, a 7-megapixel camera sensor, a flood illuminator, and a dot projector. 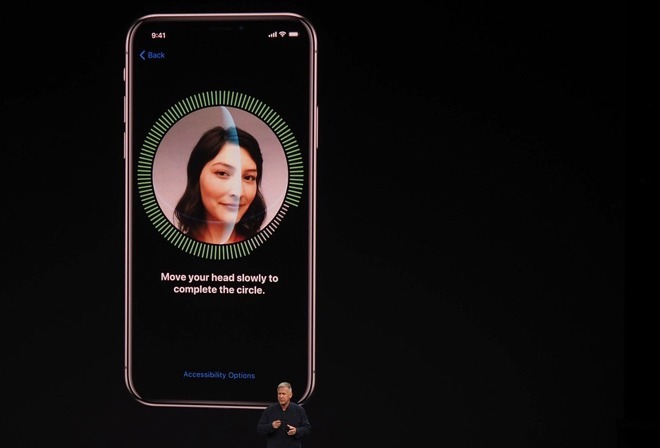 Confirming the attention of the user by detecting the direction of their gaze, Face ID then uses neural networks to match and prevent spoofing attempts to unlock the phone, with the system automatically adapting to changes in the user's appearance over time.